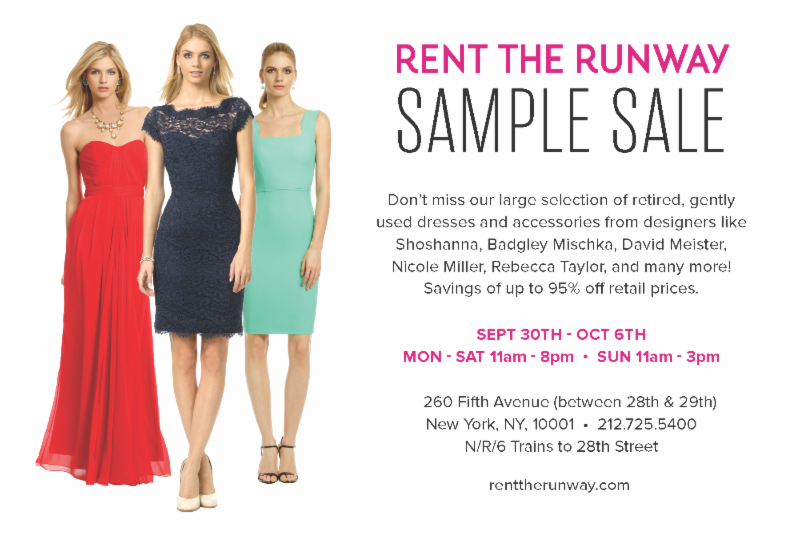 But keep up to date with upcoming sample sales right HERE! Check back often! Deal: 30% to 60% off retail prices on archival pieces, one-of-a-kind items, and limited-edition pieces. Deal: Deep discounts on men’s and women’s clothing, with everything priced at $39. Deal: Up to 90% off retail prices on jewelry, apparel, and accessories from Erickson Beamon, Monika Chiang, Issa London, Liebeskind, Twenty Cluny, CC Skye, and more. The Erickson Beamon Night Porter Necklace is $871 (originally $1,893), the Issa London Metallic Gold Knitted Dress is $343 (originally $660), and the Liebeskind Margo Bag is $155 (originally $298). There will be a nightly happy hour from 5pm to 7pm. Deal: Up to 70% off retail prices on apparel, accessories, home items, electronics, books, toys and stationery. The Tulle Canary Camilla Dress is $20 (from $70), the BB Dakota Chiffon Somervell Dress is $20 (from $54), and the Mini Foosball Table is $10 (from $36). Deal: 50% to 70% off retail prices on lingerie from Stella McCartney Lingerie, Elle Macpherson Intimates, Fayreform, and Pleasure State. Deal: 50% to 80% off sporting good clothing, footwear, and gear. The sale will include athletic and outdoor footwear, running apparel, ski/snowboard apparel and equipment, backpacks and luggage, golf equipment, watches, sunglasses, tennis racquets and bags, team jerseys, sportswear, and more. Deal: Deep discounts on a special selection of contemporary and vintage frames. Refreshments will be served courtesy of the Ground Support Café. Deal: Up to 90% off furniture, lighting and accessories, discontinued items, and showroom samples from the Finnish furniture company that offers sustainable, environmentally-friendly pieces that are modern and minimalist. Deal: Deep discounts on women’s shoes, with all pairs priced at $30. Cash only. Deal: Markdowns on DL 1961 denim for men and women, women’s leathers from Muubaa, Yoon knits, and Julie Brown separates and dresses. Deal: Shop one-of-a-kind samples and on-off product development pieces at the brand’s studio moving sale. A selection of vintage supplies, charms, tools, and books from Erica’s research library will also be available. Cash only. Deal: Up to 80% off high-end furniture and lighting, showroom models, and lightly-used products from Swedish furniture manufacturer Vitra. There will also be merchandise from Flos, a renowned Italian lighting manufacturer. Deal: Up to 75% off leather handbags from current and past seasons, as well as classic styles and exclusives. Deal: Up to 70% off men’s and women’s denim. This indie shop is selling its hip threads and accessories for $20 to $60.